The abundance of sunny weather has given us all the opportunity to go outside and give our gardens, yardens or patios the TLC they need. Get your garden sorted with a range of garden essentials from 24studio. 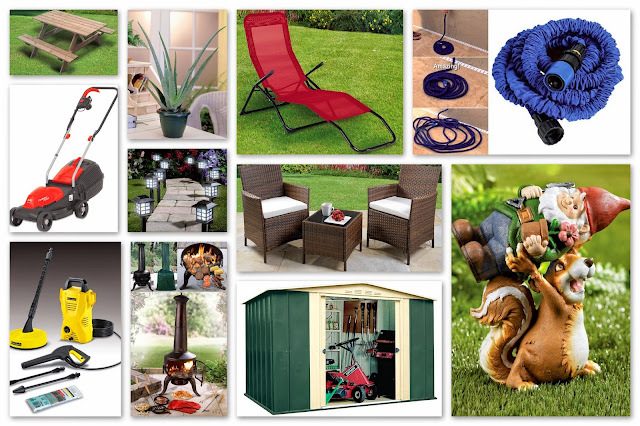 We've got sheds, hoses, planters, mowers, strimmers and more, simply head over to our Garden and Outdoor section and start shopping today. We've got a variety of products to cater for your gardening needs, the X-Hose Garden Hose is one of the most recent gardening items i have tried out and i was amazed at how light the hose was to carry, it didn't tangle in the slightest and expands up to 3 times its length when you pass water through it and CONTRACTS again in seconds, making it easy to handle and store. Prices start from only £22.99, if you want to be able to alternate the spray from mist to pressure jet to or get a little extra power for cleaning the X-Hose Nozzle and X-Hose Water Jet complement to X-Hose perfectly. Solar Lights are a great way to illuminate your garden, and there is a great range on offer at 24studio. These Lantern Solar Lights come in a pack of ten, so would look great lining a border, outlining of a garden or illuminating a pathway. There are great savings to be had on solar lighting too, these solar lights have 75% off, and are now only £14.99 for a pack of ten. Whether you're looking for a lawn mower, a strimmer, trimmer or hedge cutter, and are toying with whether to get petrol powered or electric, we've got it all covered at 24studio, with big brand names such as Flymo, Grizzly and McCulloch you'll be safe in the knowledge that you're getting quality, and with prices from only £44.99 we have something for every budget. Over recent years, chimineas have seen a huge surge in popularity, and for good reason. Not only do they make a fantastic garden or patio decoration with their rustic, almost antique design, but they’re superb for cooking a whole range of food too. You can use them to fry up meat and vegetables, bake a pizza, roast chestnuts, toast marshmallows, make popcorn, and much more. And they’re great for heating up outdoor areas too, making them ideal for garden parties in the summer. Remember, you're going to need somewhere to store all your new garden goodies, no-one wants a cluttered garden in summer, and you're definitely going to want somewhere nice and dry to store everything over winter. These Keter Storage boxes are available in earthy outdoor colours, they complement your garden and offer a practical storage solution for tools, gloves, watering cans, toys, deck chair cushions and more. For added convenience, the boxes feature rollers and handles so you can easily move them around, and are made from strong, durable plastic which won’t rust and is resistant to dents, but, if you're looking for something with a little more storage space take a look at our range of steel and high-density polyethylene sheds from brand names such as Storemore and Lifetime.